In the spring of 1986, toward the end of the Soviet empire, disaster erupted at the Chernobyl Nuclear Power Plant near Pripyat, Ukraine, located along a river bank a few miles from the southern border of the Soviet Republic of Byelorussia (now the Republic of Belarus). Soviet managers had continued to build potentially unstable graphite-moderated RBMK reactors, long after the U.S. and other advanced countries abandoned the technologies. Compounding their mismanagement, Soviet agencies approved building large power reactors without secure, heavy enclosures. The positive void-coefficient of the RBMK design is prone to runaway power surges, and the graphite components readily burn in air. The main advantage of the technologies, which mattered for early programs to produce plutonium for nuclear weapons, had been that they could operate with natural, unenriched uranium. The Chernobyl disaster resulted from rogue testing of an accident-recovery procedure, aiming to measure responses to system failures. Plans for testing, using Unit 4 at the Chernobyl plant, had been proposed by plant engineers but never submitted to Soviet regulators. Because the plans called for deliberately disabling safety systems, regulators would probably have intervened had they known. 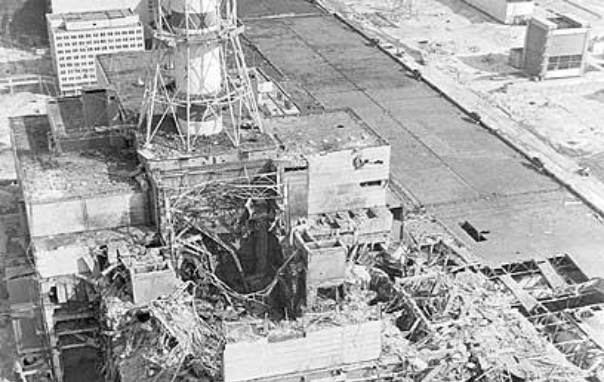 Disaster strikes: The testing was performed during the midnight shift early on April 26, 1986, by young, inexperienced reactor operators, after most plant engineers went home. Erratic maneuvers by the operators put the reactor into a highly unstable condition. An enormous power spike overwhelmed the partly disabled safety systems, causing the reactor’s water coolant to flash into steam and explode. The two-million-pound cover of the steel reactor vessel blew into the lightly built roof of the reactor building, shattering walls and exposing fuel rods and graphite components to the atmosphere. That led to a swift temperature surge. Reactor core materials caught fire, burning out-of-control for hours. Multiple explosions occurred, fed by steam and hydrogen. After burial in millions of pounds of sand and chemicals dropped from helicopters over a few days, remains of the reactor core smoldered for about a month. Two technicians directly exposed to the initial explosion died at the scene of the disaster. Aleksandr Akimov and Anatoly Baranov, a senior operator and senior engineer on duty at the time, died several days later from radiation exposure. Thousands of rescue workers and salvage workers called “liquidators” who were exposed to intense radiation suffered, and many died from radiation effects over the following years, although few were tracked. More than 300,000 residents of the area were relocated. Soviet officials tried to ignore the severity of the incident, finally outlining a disaster almost two days after the initial explosion. They and some of their successors after the end of the Soviet empire have never acknowledged the heavy burden of delayed sickness and death. Outside the Soviet empire, concealment failed. Less than 24 hours after the initial explosion, nuclear researchers working in Denmark described a reactor meltdown. A day later, U.S. satellite photos showed massive destruction at the site. Winds quickly carried fumes and particles into eastern Europe, Scandinavia and then western Europe. Strong, airborne radioactivity appeared within a week in Albania, Austria, Belgium, Britain, Bulgaria, Byelorussia, Czechoslovakia, Denmark, Finland, France, Germany, Greece, Hungary, Italy, Latvia, Lithuania, Luxembourg, Netherlands, Norway, Poland, Romania, Russia, Sweden, Switzerland, Ukraine and Yugoslavia. Within a month, radioactivity from the disaster had been detected worldwide. Testing and mitigation efforts are likely to continue in Europe for generations. Covering up a disaster scene: In a half year after the disaster, Soviet workers buried the Chernobyl disaster site in a makeshift of steel beams, concrete and metal panels. The unstable, so-called “sarcophagus,” loosely assembled from about four million pounds of materials, was not expected to last more than 30 years. Following over 15 years of negotiation, planning, design and construction, this fall a large, so-called New Safe Confinement structure, costing about $1.5 billion, has been mounted over the Chernobyl “sarcophagus” assembled in 1986. After the disintegration of the Soviet empire, there was no coherent government left to salvage Chernobyl. Most of the burdens of the confinement project are borne by countries of the European Union, who remain at high risk from further site degradation and spread of radioactivity. Despite its name, there is nothing entirely “safe” about the newly installed confinement. Experience at the Fukushima nuclear-disaster site in Japan shows that the intense levels of radioactivity inside it can degrade electrical mechanisms and robotic systems the confinement houses and polymers used to protect structural steel against rust. The confinement structure is rated to withstand an F1 tornado, but a stronger one could warp and might collapse it. The mechanisms and robotics were intended to allow recovery and permanent disposal of the Chernobyl Unit 4 ruins. However, so far no detailed plans have been published for such a project, which would probably take decades, and no funds are available to carry it out. There is no known safe repository for the debris, some of which will remain strongly radioactive for at least hundreds of years and hazardous to health for up to a million years. A substantial fraction of the reactor’s final inventory of radioactivity remains in soils and water bodies of the surrounding Chernobyl “exclusion zone”–about 1,000 square miles. No substantial remediation has been performed; none is currently planned. Trees and other plants have been allowed to grow unmanaged, absorbing radioactivity from soils. A wildfire could spread another Chernobyl radiation disaster throughout Europe. This entry was posted in Environment, History, Public health on November 30, 2016 by Craig Bolon.